5 days ago, I found a leftover blue dye in my stash and couldn't stop myself to mix it up with some conditioner then put that concoction on my hair. Then I was so happy to have a blue hair once again, ... I applied it by hand and I only coloured my hair 1 inch away from my scalp to get a "grown out" look. It was the best thing that I did for whole July, yet the color only lasted about 3 days because I only left it on my hair for a quick 5 minutes, so I don't think it penetrates my hair enough to last for 1 week, let alone 2 (had so much damage already, I don't want to worsen it up). Now I have this weird looking, grayish-green hair that can only be seen in direct light or something. But then again, I love it regardless. My hair was a bit more coarse than before I dyed it. Not a big deal because I have been dealing with coarse hair for so long now, and the state of coarseness was not that bad, so it can be fixed with a trip to conditioner aisle. But .. at one point, my hair started breaking again. Ugh! I have take a good care of my hair to minimize the breaking and I ruined everything (well, not every-thing but definitely had a little tantrum inside my head)! Guess what, the day my hair started breaking was the day that I ran out of my hair oil! What a very nice day, it was. So I quickly made a trip to the drugstore and in the hunt for some nourishing hair oil. Fingers was crossed so hard that day. 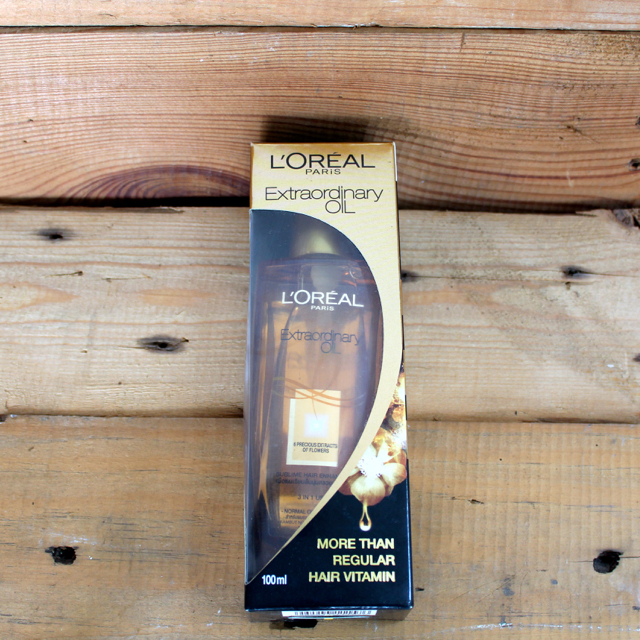 Upon arriving to the first place, I found my trusted hair mask and L'Oréal Extraordinary Oil, but I made a trip to the second drugstore just to check the price difference (Oh, yea .. totally being a woman. We shop carefully, even the slightest gap made a difference). But I couldn't find the hair oil in the second drugstore and the trusted hair mask was cheaper in the first store, so there went I back to the first store. 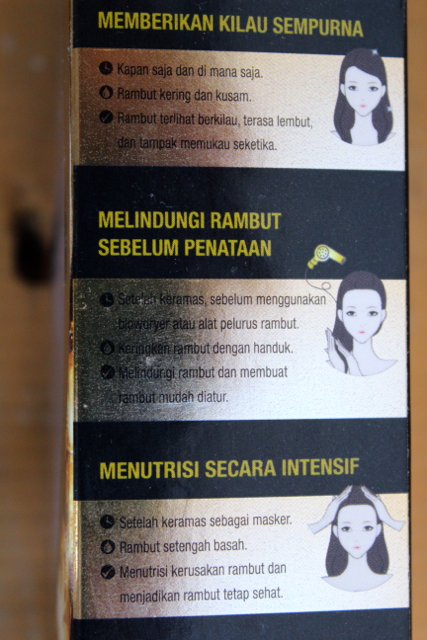 After paying both the hair mask and oil, I rushed back home then washed my hair then I tried this product. Has pump with a "twist to lock" system for easier "measurement". 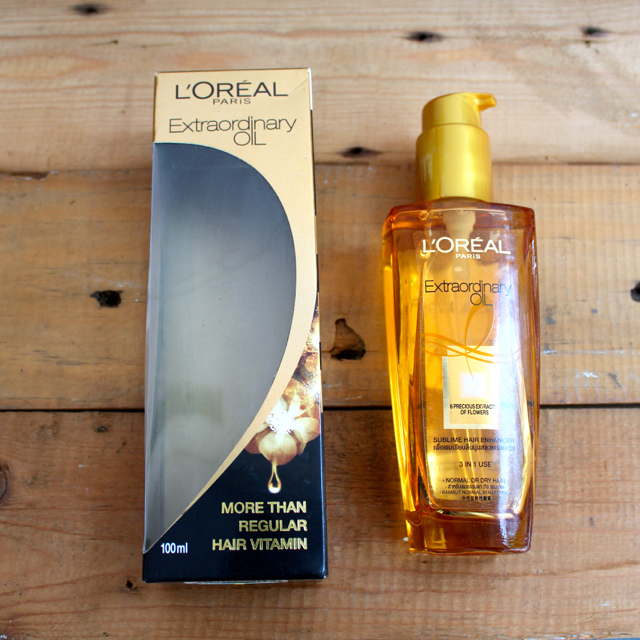 Product is liquid-ish and easy to distribute all over the hair. Smells like camomile, vanilla, nutty, musky-ish. After the product left to dry, hair was amazingly soft and fluffily healthy. 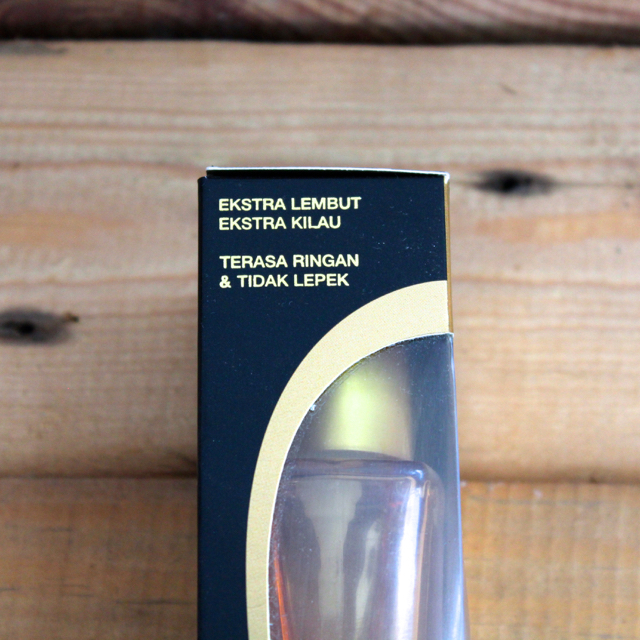 Lotus Oil gives an intense nutrition. Camomile Oil boost shine and radiance. Tiara Flower Oil protects from dryness. Matricaria Oil softens and relaxes hair texture. Rose Oil protects from external aggressors. On the website I landed in, it said that this product is "a perfectly balanced oil with a texture so absorbing that it instantly penetrates and adjusts to the specific needs of each hairtype to nourish and provide perfect care". 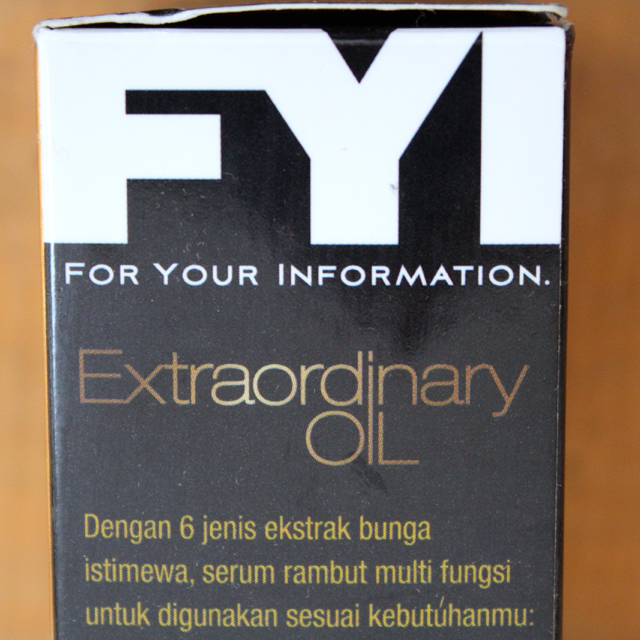 Like, ... all of them are true but I found that with Indonesia's humidity the effect of this extraordinary oil can only last for 2 or 3 days. But if you're in a controlled temperature, air conditioned room all the time, I bet it can last way longer. Despite that one problem, I recommend you to get this product because with all it's glory - the price is super affordable (available online, drugstores, and groceries stores)! !